Forum Index > Historical Arms Talk > What are "plate-sleeves"
Posted: Fri 08 Jul, 2011 3:45 am Post subject: What are "plate-sleeves"
"And therefore banish not only from your Court, all traitorous offensive weapons, forbidden by the Laws, as guns and such like, but also all traitorous defensive arms, as secrets, platesleeves, and such like unseen armour: For, besides that the wearers thereof, may be presupposed to have a secret evil intention, they want both the uses that defensive armour is ordained for; which is, to be able to hold out violence, and by their outward glancing in their enemies eyes, to strike a terror in their hearts…"
I'm pretty sure that a secret is a steel skullcap worn under a hat (In Italy it was called a secrete or capelline). I'm guessing that plate-sleeves are some sort of concealed arm armour, but I have no idea what it might have looked like or which part of the arm it protected. Any ideas? I'd also be interested in reading about any other more obscure kinds of historical concealed armour (not the obvious ones like brigandines and jazerants). I could be wrong but I thought that " secréte " also included a mail shirt or vest worn under clothing. Might apply generally to a metal cap hidden inside a hat as well. Want to bet that James I may have made an exception for himself or very trusted friends or " favourites ": Afraid of assassinations it would make sense to want to ban these from court, but also afraid of assassination to wear one oneself ! From an The journal of Arms and Armour Society article on Jacks and Brigantine 1989. The image is quickly cut and pasted out of a larger scan. Looks kinda like the plates from a Japanese kote sewn inside of the sleeve. Exactly what I was after. Many thanks. Which museum are these in? Item. Three sheaves of arrowes, two paire of plate sleeves, and eighteen other arrowes. These were likely intended for an archer. Sorry, I don't know museum, I have not read the article for a number of years . 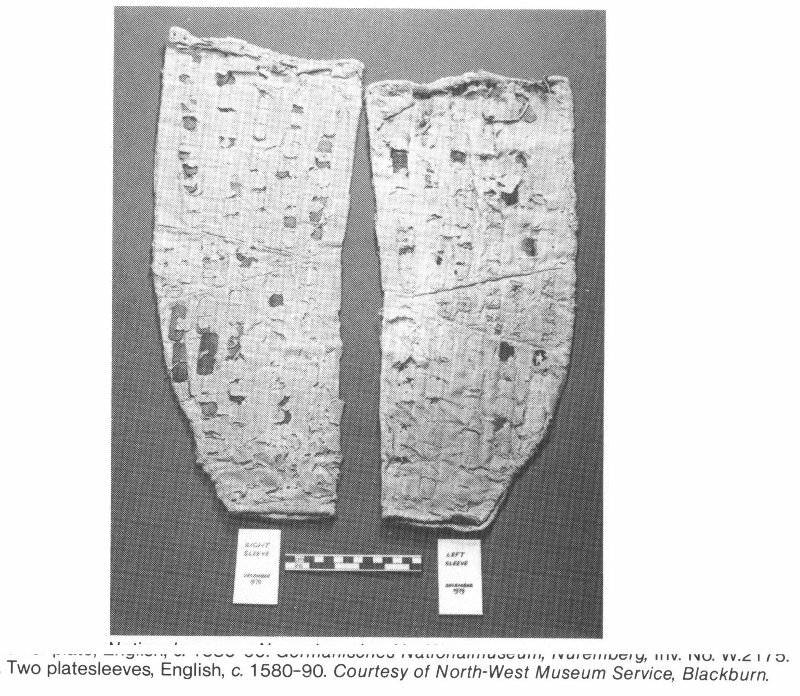 The footer to the image says, "North West Museum Service, Backburn . A quick google gives me three possible information sources. I would argue that Jame's proclamation was likely referring to something made in the same vain as it fits time and place fairly well but hidden in far more impressive clothing. Are there any plates in the elbow section? I am only guessing based on the image I would say yes. Eaves, Ian, On the Remains of a Jack of Plate Excavated from Beeston Castle in Cheshire.The Journal of the Arms and Armour Society, Vol XIII No.2 Sept. 1989 pp81-154. I don't suppose that someone could summarise the findings? I wish, I can't even find a copy. I am off traveling this week. If someone has not already done it I will see if I can find and reread the article and write synopsis when I get back. p. 88 "The only other explanation which seems to suggest itself for the function of the oblong plates found at Beeston Castle, is that they may have formed part of a pair of arm-defenses worn with the jack. ...Two surviving jacks of the third quarter of the 16th century still retain such sleeves. The sleeves (Plate XLI-B) are of fairly voluminous form, shaped to the elbows, and constricted at the wrists. They consist, like the jacks themselves, of iron plates sewn between two layers of canvas. The plates are of oblong form, about 5.5 cm long and 1.6 cm wide, with cropped corners and a single central hole for the stitches. The outside of each arm is protected by five columns of overlapping plates. Each column is separated from its neighbours by a gap of between 1.5 to 3.0 cm, according to its location. The columns are broken only at the elbows where a separate gusset in the fabric of the sleeve is covered with four or five columns of smaller plates of the more conventional, square type, to give greater flexibility. The smaller plates also occur, in one instance, at the wrists: for the same reason. The insides of the arms are protected either by two short columns of plates protecting the forearm only, or by a single, full-length column at the fron, broken only at the elbow. The tops of the sleeves are provided with lace-holes so that they could be tied either to the jack itself or, more probably, to the garment beneath it. The cuffs, which are split at the back to permit insertion of the hands, are also provided with lace-holes. The plates from Beeston Castle, although similar in length to those occurring in the platesleeves just described, are, in most instances approximately twice as wide as them, and pierced with two holes instead of one. it is nevertheless that other patterns of platesleeves than those recorded were produced ..."
Plate XLI-B is labeled "Two platesleeves, English, c. 1580-1590. Courtesy of North-West Museum Service, Blackburn." Preserved in the collections of the North Western Museum and Art Gallery Service, Blackburn and the Royal Armouries, H.M. Tower of London, No. III.1885. respectively (see note 29 above). ... Another of similar date, retaining its plated sleeves was recently acquired from the collection of Mr Edward W. Budde Jr., Amityville, New York, for the Royal Armouries, H.M. Tower of London, No. III.1884. A further jack of the same pattern, also retaining its sleeves, together with another, lacing down the right of the chest and lacking its sleeves, was lent by the late Mr John Forrester to Rufford Old Hall, Lancashire, and is now in the care of North Western Museum and Art Gallery Service, Blackburn. These formed a part of the ffarington collection at Worden Hall, Lancashire, which was dispersed by auction in 1948. An inventory of the collection, purchased at the sale by Mr Forrester, former manager of the Worden Hall Estate, is now in the possession of his son of the same name, at Maudsley Hall, Lancashire, and shows there to have been three such jacks in the ffarington collection in the 19th century. The third is very probably that now in the Royal Armouries ..."
I traded some emails with a staff member at Blackburn Museum & Art Gallery https://blackburnmuseum.org.uk/museum/contact/ and she tells me that North Western Museum and Art Gallery Service, Blackburn was a small business which closed down some years ago. I suggest that anyone on this forum who likes concealed armour from the 16th century start emailing and calling people in Lancashire to track down the heirs of the Mr. John Forrester Jr. of Maudsley Hall, Lancashire who died on 5 November 2012. If you want more information, the Arms & Armour Society still has some back issues.